The greater the obstacle that a body can overcome, or that it can resist, the greater may we say is its force, provided that, without meaning to express by this word a hypothetical entity which resides in the body, we use the word only as an abbreviated way of expressing a fact, just as we say that one body has twice as much velocity as another instead of saying that in equal times it traverses twice the distance, without intending to mean by this that the word velocity represents an entity inherent in the body. if it be necessary to obtain a certain velocity, by means of the descent of a heavy body from a height, to which we can carry it by a flight of steps, we must ascend, if we wish to double the velocity, a quadruple number of steps, and this will cost us nearly four times as much labour. In this we can see that Young’s energy was in fact more general, extending to include the mechanical energy’s potential component. Coopersmith notes that the term energy was soon also applied to various non-mechanical phenomena, including electricity, light and chemical reactions. Even so, the modern energy view, based on a comprehensive understanding of the equivalence between work and heat, was still a considerable way off. We’ve seen how, at the time of his death in 1832, Sadi Carnot appeared to be on the brink of an important insight connected with this—that inter-conversions can occur between the bulk and small-scale particle motions associated with mechanical work and heat respectively. We’ll now fast forward to the decade following Carnot’s death, in which the modern view based on the equivalence of work and heat finally emerges. The crucial insight in relation to this was that a quantity associated with physical phenomena could both be conserved, and converted between different forms—this is the basic foundation for energy law 1. Given the generality of this insight—its applicability to any physical situation—it’s particularly interesting that when it did finally emerge, it arose almost simultaneously in the context of two quite distinct experiential settings. We find its first statement in a paper titled “Remarks on the Forces of Inorganic Nature” by Julius Robert Mayer (1814-1878), published in 1842 (it would be some time yet before Young’s term energy was applied to the conserved quantity). Mayer was guided specifically by the principle of ’cause equals effect’, and noted that in order for this to apply in all situations, a ’cause’ had to be both indestructible and convertible into different forms. In his 1842 paper, Mayer uses the equivalence between what we now call gravitational potential energy and the kinetic energy of a falling body as his prototypical example of the conservation principle, but also goes on to apply his thinking specifically to the equivalence between heat and the bulk motion of bodies, extending this to the performance of steam engines as well as a range of other physical phenomena. To fully appreciate the general nature of his ideas, it’s worth looking back to the context in which they originally arose. As the physician on a ship sailing between Rotterdam and Java, he noticed changes in the colour of the sailors’ blood. In the tropics, this was a much brighter red. He realised that the higher temperature in the tropics necessitated less oxygen being drawn from the blood in order to maintain body temperature. On the basis of this, he inferred a general conservation principle that must be applicable to all physical processes. Joule used as his basis for quantification of heat the temperature rise in a quantity of water. This allowed him to arrive at the quantity of mechanical work—the product of a weight by the height through which it fell as it rotated an electric magneto—required to heat a pound of water by one degree Fahrenheit. He compared this result with those of other experiments involving work carried out directly on a quantity of water and later, a volume of gas. This culminated in the experiment for which he is perhaps best known, involving a paddle-wheel, driven by falling weights to agitate a container of water, leading to a rise in the water temperature. The results of this work were published in 1845. Today, his remarkable contributions are recognised by the designation of the unit for energy in the International System as the joule. We have now reached the historical juncture at which energy law 1, the conservation of energy, is fully established, especially in terms of the equivalence between work and heat. At this time, however, the term energy itself had still not been applied to the conserved quantity that takes different forms according to the specific physical phenomena associated with a given situation—in fact, neither Mayer nor Joule had framed their findings in terms of a conserved conceptual object. Moreover, the kinetic theory of heat remains at this point contentious. So the underlying insights about ‘what is going on’ are starting to come into line, but these are not yet structured into the formal understanding that comprises the modern energy view. This formalisation was, however, only a few short years away, in the work of Rudolph Clausius (1822-1888) and William Thomson (1824-1907). It would culminate in: the statement of the first and second laws of thermodynamics; the introduction a new conceptual object, the total or internal energy of a system, to account for the first law’s conserved quantity; the introduction of an additional new conceptual object that we have not previously met up to this point, the entropy of a system; and finally, the acceptance of the dynamic or kinetic theory of heat as the basis for linking work and heat. I’ll pause for a moment here to provide some background that might help with interpreting the subsequent discussion of the thermodynamic laws and related concepts. This will necessitate leaping forward a little and pre-empting some of the developments that we’ll encounter in that discussion. Our energy law 1 and energy law 2 are, respectively, the domain-general equivalents of the first and second laws of thermodynamics. That is, the first and second laws of thermodynamics, strictly speaking, apply to the specific context for which they were first formulated i.e. systems of matter acting under the thermal dominance of their environments—and yet the physical principles that they describe in that specific context apply more generally. This means that we can certainly extend them beyond their original context, but we need to exercise some care in how we do so. In the case of the first law of thermodynamics, given the generality of the total energy (or internal energy) as a system property, this is relatively straightforward. In relation to the second law, it is less so. This issue relates to the system property that Clausius introduced several years after he initially formulated the second law, in order to quantify the invariant tendency of thermodynamic systems that it describes. That property is the system’s entropy. While the total energy is a property of any physical system, entropy is specifically a property of thermodynamic systems. These are systems for which the physical behaviour of interest is thermal in nature i.e. dominated by the micro-scale motions of the system’s constituent parts, and for which the temperature is (for most situations though not exclusively) the principal property of interest for characterising the system’s state. While it’s true that any ‘real world’ physical situation in which we’re interested can be characterised in thermodynamic terms, it’s not necessarily the thermodynamic behaviour that is of principal interest to us. For instance, in relation to a mechanical system such as our original example for energy law 1 (the chair-floor-bottle system), when we’re considering only the behaviour of the macro-scale components the property entropy has no relevance (and in fact, simply has no meaning in that context). Even so, the invariant tendency that is quantified in terms of the entropy specifically for thermodynamic systems, that of energy dispersal, is relevant in all systems, including our simple mechanical example. This is the primary reason that I didn’t introduce the thermodynamic property entropy in setting out energy law 2—it is highly relevant in coming to terms with the behaviour that energy law 2 describes in thermodynamic contexts, but is not generally applicable in all situations to which energy law 2 applies. There is, however, an additional reason that I left out any reference to entropy in that earlier discussion. The second law of thermodynamics, and the thermodynamic property entropy, are some of the most widely misinterpreted and misapplied of all scientific ideas. Most people with some general scientific awareness have heard of them—unfortunately though, given the extent and influence of popular works from authors who either didn’t understand the original ideas, or who extrapolated them to situations to which they did not apply, most people’s understanding bears only a passing resemblance at best to what the originators had in mind. This is not the place to go into the detail—for those interested in following up further, a comprehensive account is available here (the link is to a slightly revised version of an article titled “Thermodynamics, entropy and disorder in futures studies”, published in the journal Futures). The key message that I’d like to convey here is that while the laws of thermodynamics are some of the most general and fundamental in all of physics, they nonetheless arose in and hence strictly apply to specific contexts. As I pointed out in Thinking with systems—Part 1, keeping in mind the contextual basis of the conceptual tools that we wield is very much central to the systems approach. In fact, thinking with systems is in many respects all about developing the practice of keeping as much context as possible in view as we navigate the situations in which we’re immersed. A key entailment of such context-sensitive practice is that it helps with avoiding the trap of certainty, and the constraints that this can place on our thinking. This may seem rather counter-intuitive—surely the benefit of cultivating a more comprehensive way of thinking is that it should provide us with greater, not lesser, certainty? Well, this might be the case if a systems view in fact supported the contention that ‘absolutely certain’ knowledge is eventually possible, if only we apply enough effort in the right way to the business of knowing. As we saw a few weeks back though, a systems view actually reveals to us a very different way of appreciating the nature of cognition and what it is that we do when we cognise—when we know something. I’m emphasising this again here, as a caution against taking as ‘absolute truth’ the remarkable insights of the thought leaders we’re hearing from in this story of the energy concept. Instead, I’d encourage regarding these as effective ways of accounting for direct experiences in the context of particular ways of engaging with the situations that the originators were dealing with—with these effective accounts nonetheless needing to cohere adequately with the ways things seem to be for other investigators. Indeed, this coherence can be viewed as the very basis for regarding their accounts as effective—as suitable for guiding practical action. the accomplishment of work requires not merely a change in the distribution of heat, but also an actual consumption of heat, and that, conversely, heat can be developed again by the expenditure of work. In the above expression, Q is the sum of all the heat transferred to and from the system, and W the sum of all the work done on and by the system. Here at last, we find the modern energy concept explicitly defined—though even at this stage, still not named, and still not formally extended to cover all forms of energy that we recognise today. It is impossible, by means of inanimate material agency, to derive mechanical effect from any portion of matter by cooling it below the temperature of the coldest surrounding objects. In light of the expanded view of energy introduced by Thomson, we can now observe that the property U is specifically the thermodynamic component of a system’s internal energy. For systems in which other physical phenomena beyond the thermal behaviour are significant, other terms are needed in order to account for the overall internal energy. For instance effects due to electrostatic or magnetic fields may be important; changes in elevation and hence in gravitational potential energy may be significant. In the practice of thermodynamics today, it is this more general understanding of internal energy that prevails. If other physical conditions can be neglected (as is often the case), this will be made explicit in defining the system under consideration, and the internal energy will be expressed in terms of the function U alone. In accepting the dynamic theory of heat, Thomson established a conceptual basis for simultaneously accommodating both the derived principle of energy conservation and the observation of all ‘real world’ physical processes as irreversible (only ever proceeding in one direction—as in the slowing down of a pendulum due to friction, or conduction of heat from higher to lower temperature—and never spontaneously in the reverse direction). In the dynamic theory, bulk motion of a body could be diminished, without violating the overall conservation of the body’s motion, by distributing this to associated small-scale motions. The aggregate increase in small scale motions is equivalent in quantity to the decrease in bulk motion. Thomson described this in a paper published in 1852 titled “On a Universal Tendency in Nature to the Dissipation of Mechanical Energy”, recognising the general dissipative nature of physical processes, and the tendency of energy to disperse. Here we see the complete expression of what we have called energy law 2. Just to round out one other key thread in our story, in that same year Thomson also took up the terms potential and actual energy (initially introduced by William Rankine (1820-1872) shortly prior to this), finally replacing the term actual with kinetic in 1862. Entropy has units, in the International System, of J/kg.K, or joules per kilogram-Kelvin. It is specifically a property of a system, and not of “matter in general”, “substances” or “objects” per se: its value is dependent on a system’s state, and the type and quantity of matter of which the system is comprised. Unless all of those parameters are defined, entropy cannot be defined and has no relevance. It is not meaningful to compare, for example, “the entropy of raw and refined materials”, as is often done in the ecological economics literature. Perhaps in the most practical terms, the property S, the entropy, provides us with a measure of a system’s capacity under given conditions to provide a useful work output. In other words, it allows us to ascertain the quantity of internal energy that is available to do work. This concept of energy availability will take on an important role as our inquiry proceeds, as it provides a very important means of comparing different energy sources, particularly where these take different physical forms. How to connect this with the very general expression of energy law 2, stated simply as ‘energy disperses from being more concentrated to more spread out in space’? In simple terms, once an energy ‘concentration gradient’ has been depleted—that is, once a system’s energy is at the same concentration as the surrounding environment—the energy associated with the system cannot do further work on or transfer heat to that environment. To state this more generally, the system cannot effect any further physical changes in its environment—the system and its surrounds are in equilibrium. A heat engine’s basic principle of operation involves the provision, via the working fluid, of a thermal connection involving a continuous temperature gradient between the heat source at a higher temperature and the heat sink at a lower temperature. For the engine to operate continuously, i.e. for it to do more than take in an initial ‘batch’ of heat and produce a single ‘batch’ of work before ceasing operation, the working fluid must eventually return to its initial state. In other words, it must pass through a closed cycle of states. In order for the engine to deliver work output, the working fluid, which must be a gas during this phase of the cycle, expands from a higher to a lower pressure. Figure 1: schematic diagram showing arrangement of equipment that could in theory be used to implement the air-standard Carnot cycle operating with steady-flow. 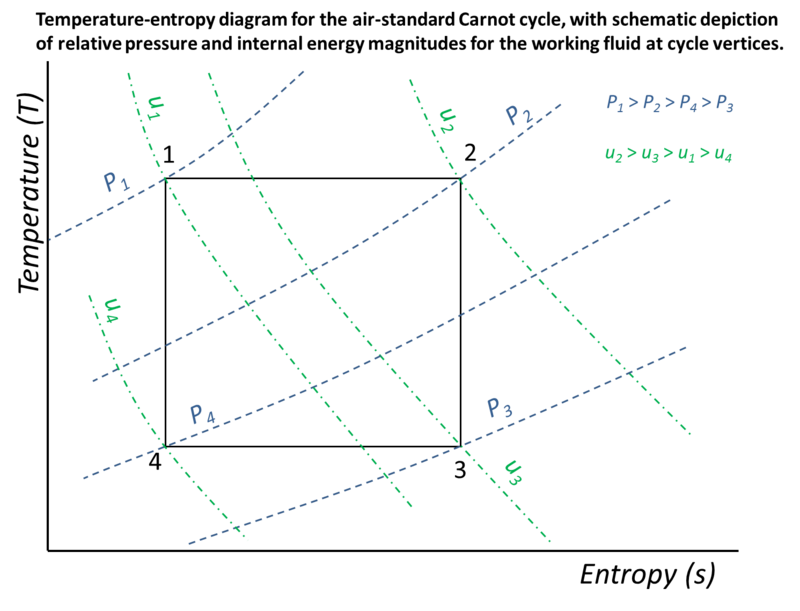 Figure 2: Temperature-entropy diagram for the air-standard Carnot cycle, showing the relative magnitude of pressure and specific internal energy at each of the cycle vertices. For all working fluids, when this expansion phase has completed and the fluid is at its minimum pressure, its internal energy will always be higher than at the start of the cycle, i.e. higher than that corresponding to the state immediately prior to the next heat input phase. In order to return to its initial state, the internal energy of the fluid must be reduced via heat transfer to an adjacent low temperature sink, and the pressure of the fluid must be increased, to the level corresponding with the start of the heat input phase. The pressure elevation phase requires a work input, reducing the net work output from the expansion phase. These requirements are all fundamental physical entailments of the behaviour of gases, specifically the invariant relationships between pressure, volume, temperature and the quantity of gas. Figures 1 and 2 depict this diagramatically, for the theoretical air-standard Carnot cycle–the ideal, maximum efficiency heat engine cycle, operating with air as the working fluid. In effect then, a heat engine’s working fluid provides a pathway for energy at a higher concentration (associated with the higher-temperature heat source) to spread out in a continuous manner to a lower concentration (associated with the lower-temperature heat sink), while at the same time diverting a portion of the work-capacity associated with this dispersal for useful purposes. A heat engine can therefore be thought of as a device for producing a bulk-motion effect through the dispersal of energy from higher to lower concentration, which in this case takes the specific form of heat transfer from a higher temperature heat source to a lower temperature heat sink. Roughly speaking, we can say that what is being dispersed is the internal energy’s utility for effecting changes in the material configuration of the associated system and its environment. In closing, an observation made by Jennifer Coopersmith seems especially pertinent in the context of our inquiry. She notes that the second law’s empirical basis is not just a matter of physical measurement, but also the collective weight of ‘common experience’. In the terms introduced here at Beyond this Brief Anomaly, we might say that the observed invariance in physical behaviour, rather than the construction of a specific conceptual object, played the principal role in development of the second law of thermodynamics. In this respect, it seems particularly relevant that the object introduced to quantify the second law, the property entropy, was introduced a number of years after the second law’s first statement by Clausius. Entropy was not some pre-existing entity waiting to be discovered by Clausius, but a powerful conceptual device for quantifying and hence formalising the invariant behaviour that he and Thomson had recognised as so significant. While our historical overview has been, as indicated at the start of Part 1, highly selective, covering the territory has also been a significantly larger task than I initially envisaged. This is the nature of an inquiry-based approach—it allows scope for expansion as the terrain, under detailed examination, reveals itself to be more nuanced than when viewed from a distance. Nonetheless, what I’d thought might be a single post has become three lengthy ones, and so I’ll keep this summation as brief as possible. On one hand, we have the more instrumental perspective of the engineers, in which energy emerges as the capacity to effect change in the way that motion of physical bodies and their constituent small parts is distributed. There may be some value in characterising this as an outside perspective—the view from outside the physical situation under consideration. On the other hand, we have the descriptive and causative perspective of the physicists, in which energy emerges as the quantity of motion, both actual and potential, associated with physical phenomena in their diverse forms. And in symmetry with the above, perhaps this might be regarded as an inside perspective, the view from inside the physical situation being considered. Work can be usefully regarded as both a measure of and the process by which change occurs in the configuration of and the ‘quantity of motion’ associated with macroscopic-scale material bodies. Energy can be usefully regarded as a measure of the ‘quantity of motion’ associated with a system of material components at a particular time, recognising that at any time, the total ‘quantity of motion’ comprises both actual motion, and potential motion, the distribution of the energy between these two types being a function of the relative positions of the system’s components i.e. a function of changes in their spatial configuration. The energy view allows for considering continuity of the ‘quantity of motion’ across physical phenomena involving matter in different forms. The nature of the physical situation in which we’re interested determines the forms of energy associated with that situation; if we’re dealing with macroscopic material bodies, including bulk motion of gases and liquids, this is mechanical energy; if we’re dealing with motion at the atomic scale, and without changes in chemical composition, this is thermal energy; and so on with chemical, electric, magnetic, nuclear and electromagnetic phenomena. Even for the rationalists, who associated the conservation of ‘cause and effect’, ‘activity’, or ‘quantity of motion’ with metaphysical principles, it’s apparent in the historical record that what we today call energy and its precedent concepts was not regarded (at least by the foremost investigators) as some sort of entity or inherently existent thing. While the substance theory of heat in the eighteenth century certainly tended in this direction, and continued to have many influential supporters even at the time of its supersedence, by the time the modern energy concept fully emerged in the mid-nineteenth century, it was no longer tenable. Moreover, we can trace all the way back to Galileo the way that the quantity energy is always necessarily associated with a system defined by the observer of the physical situation under consideration—in the absence of an appropriate system definition, there is no energy; the quantity of energy associated with a physical situation is always relative to the system that we establish to characterise that situation. Despite the myriad ways in which popular accounts of energy manage to present the subject such that this is obscured, we can see from the first and second laws of thermodynamics themselves just how essential energy’s system-relative character is to appreciating what it is all about. The very definition of the conceptual entities at the heart of these laws, internal energy and entropy, have—by virtue of the fact that it is the way they change with system state that is important to us—the systems approach at their core. This brings to a close our detailed exploration of foundational ideas. As the inquiry proceeds into what we might call the applied phase—as we start to look at the connections between energy and society, equipped now with this toolbox of basic concepts—there will be numerous points at which it makes sense to step back and lay down further conceptual foundations. I’ll approach that on an as-needs basis though, and I’ll aim to tie the discussion in directly with the particular societal questions that we’re grappling with. This will certainly be the case in the next post, in which I’ll kick off by looking at how we talk about energy sources. The background work that we’ve done in starting to appreciate the highly abstract nature of the energy concept will come into play there in an important way, and we’ll at last start to see the implications and consequences of this act of conceptually ‘abstracting away’ from the detail of what is actually going on immediately in front of us. Note 1: At least, for the first time in a form recognisable as being consistent with contemporary use—as we saw last week, the term did appear briefly in a physics-related reference early in the eighteenth century, though not in a familiar context. Note 2: The term energy is derived from the Greek ενέργεια, energeia, meaning “actuality, identified with movement”, a term originally introduced by Aristotle. Note 3: It is in fact possible–in principle–to convert heat to work with an efficiency of 100 percent. This is achieved via an isothermal reversible expansion, in which heat is transferred to a gas as it expands at a rate sufficient to maintain a constant gas temperature. I highlight that this is possible “in principle”, because any reversible process is always an ideal that cannot be realised in practice. We can, however, approach the ideal of reversibility i.e. there is no theoretical barrier to this, the barriers are essentially practical. Note, though, that for 100 percent energy conversion efficiency to be achieved, then the reversible process must proceed “one way” only i.e. 100 percent efficiency can be achieved only if we don’t want to return the gas to the initial state that it was in prior to commencing the expansion, in order to carry out a subsequent expansion. This is why I emphasise that the limiting Carnot efficiency applies explicitly to thermodynamic cycles. Note 4: Clausius derived the term entropy from the Greek word for transformation, τροπή, specifically for this purpose. Magie, William F. (1935). A source book in physics, McGraw-Hill Book Company, New York. This is an anthology of excerpts from the original publications of physicists (as we now know them) from Galileo onwards; it includes work from many (though not all) of the pioneering investigators covered in this and the previous posts. This has provided a convenient way of reviewing some of the original sources, particularly where these are not quoted directly in the principal secondary reference that I’ve drawn on, Coopersmith’s Energy: the subtle concept. Smil, Vaclav (2006), Energy: a beginner’s guide, Oneworld Publications, Oxford. Young, Thomas (1935), in Magie, W. ed., A source book in physics, McGraw-Hill Book Company, New York, pp. 59-60.
 d’Alembert, Jean la Rond (193), in Magie, W. ed., A source book in physics, McGraw-Hill Book Company, New York, pp. 55-8. Young, A source book in physics, p. 60. Coopersmith, Jennifer (2010). Energy: the subtle concept, Oxford University Press, Oxford, p. 176. Mayer, Julius (1935), G.C. Foster trans., in W. Magie ed., A source book in physics, McGraw-Hill Book Company, New York, pp. 196-203. Coopersmith, Energy: the subtle concept, p. 247. Clausius, Rudolph (1935), W. Magie trans., in W. Magie ed., A source book in physics, McGraw-Hill Book Company, New York, p.229. Thomson, William (1935), in W. Magie ed., A source book in physics, McGraw-Hill Book Company, New York, p.244. Coopersmith, Energy: the subtle concept, p. 294. Clausius, Rudolf. (1856). “On the Application of the Mechanical theory of Heat to the Steam-Engine.” in: Clausius, R. (1865). The Mechanical Theory of Heat – with its Applications to the Steam Engine and to Physical Properties of Bodies. London: John van Voorst. Coopersmith, Energy: the subtle concept, p. 302. This entry was posted in Foundational ideas and tagged Clausius, entropy, first law, heat, internal energy, Joule, Mayer, second law, thermodynamics, Thomson, work, Young by Josh Floyd. Bookmark the permalink.